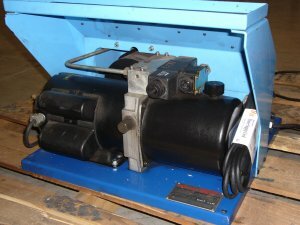 This is a real clean used 1-1/4" one, two and four wire adjustable hydraulic hose crimper. Now is your chance to have one for your facility. Or, you can start your own hose business. 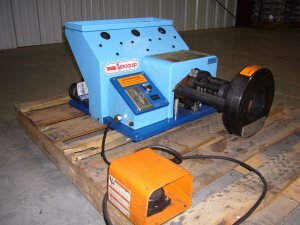 If you are an established hose shop, this machine makes a great first or second line crimper! This is a variable (adjustable) hydraulic hose crimper, which means that you can meet all the different crimp specs of other manufactures, not just Aeroquip. 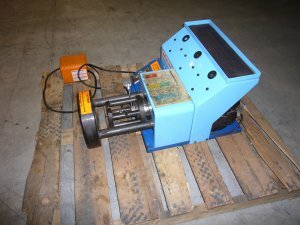 This machine has been used, but all of the electrical, hydraulic and mechanical systems are in very good condition. We will include an Operator's Manual with the equipment. And, Aeroquip has a reputation for making a top quality and highly reliable hose crimper. Included is a full set of drop-in caged dies. For additional information, check out the Aeroquip Product Literature for the FT1330 hose crimper at http://hydraulics.eaton.com/products/pdfs/ft1330-500.pdf.